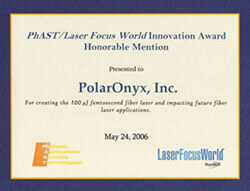 Laser-Femto envisions that our patented proprietary technology (over 27 granted patents on fiber lasers) will revolutionize development of ultrashort pulsed fiber lasers and impact future applications. These key disruptive technology platforms are pulse shaping, spectral shaping, and polarization shaping pulse shaping. Laser-Femto's proprietary shaping technologies provide capability of manipulating photonic signals to deal with nonlinear distortion, gain narrowing, timing jitter, and noise degradation. It enables the most innovative and reliable laser for future material processing, biomedical imaging & spectroscopy, optical communications, and optical sensing. 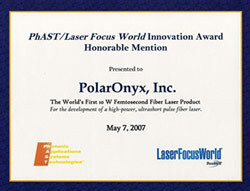 These technologies ensure high efficiency, excellent repeatability and high energy/power laser operation by using commercially available rare-earth doped fibers. It is the most cost-effective solution and has the best performance to cost ratio.